Retro Rubber Challenge Blog #106 "Mad About Stripes"
Always Fun Challenge #102 "Dogs or Cats"
I was inspired by the card made by Sara with her lovely purple card at Sentiments by Sara. I change the colors, some of her design, and added a puppy. I wanted the inside of the wheels to be clear so you could see behind the bike... little did I know what I was getting into! 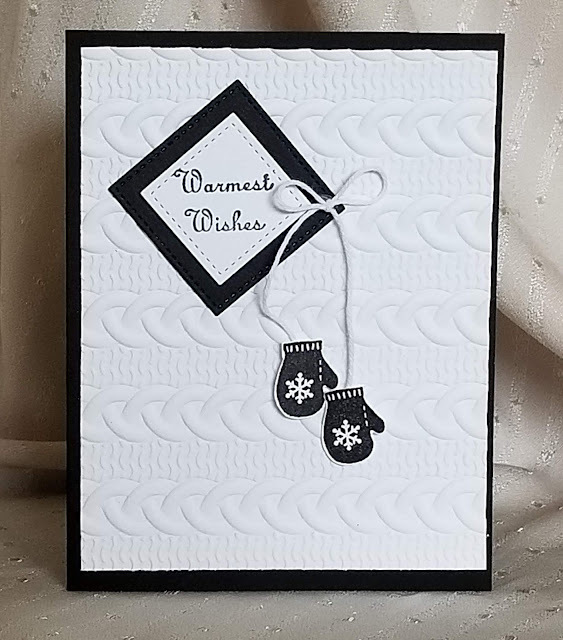 I first stamped the wheels on heavy white cardstock, then used the circle die from the Stampin' Up! (SU) "Build a Bike" framelits dies to cut out the entire wheels. Then using a smaller Sizzix circle die, I cut out the inside of the wheel to get rid of the spokes. Next, I used the wheel stamp with Stazon black ink and stamped the wheels onto stiff acetate. Then stamped the rim of the tire on the acetate using Stazon Mustard ink on the acetate. 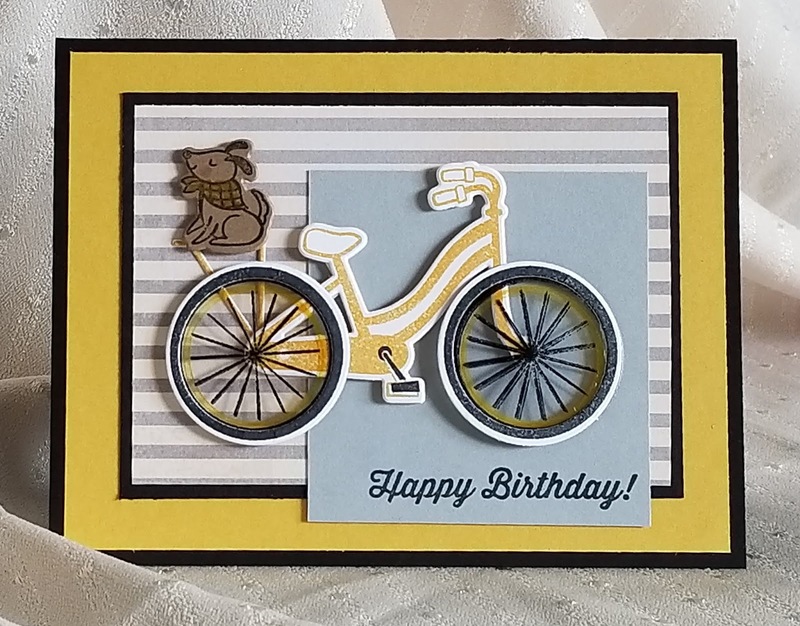 If I were to do it over, I would have found an even smaller die and only cut the spokes out, leaving the yellow rim on the white cardstock. The rest of the bike was pretty straightforward with the SU stamps and dies. The bike frame was stamped with SU So Saffron ink. 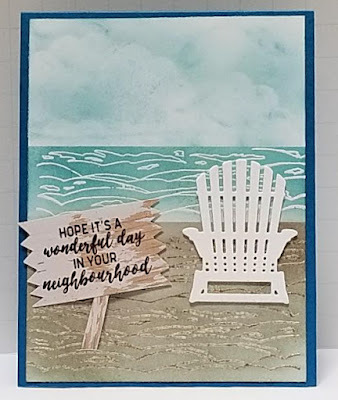 I used the SU Stamparatus stamp positioner to do all the stamping for this card. It's just so much easier to stamp an image multiple times to get the impression nice and filled in. The cute little pup was stamped with dark brown ink onto SU Crumb Cake cardstock. His scarf was hand colored with a marker in yellow to match the bike. The light yellow and gray striped paper is a Recollections "Valentine" paper pad. I chose it to complement the bike. 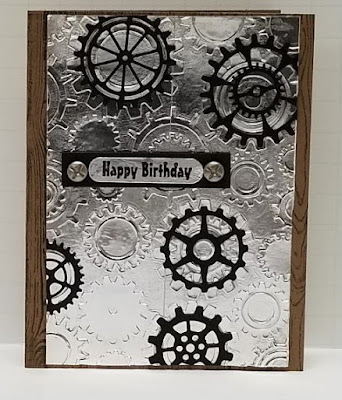 The sentiment was stamped on the SU Smoky Slate panel with Memento black ink using the SU stamp set "Birthday Banners". The puppy and bike were mounted to the card using many thin pieces of adhesive foam tape. I wanted the bike raised off the card so it was more apparent that you could see through the wheel spokes. I think this card would work for a guy or gal; grownup or kid. A bike is such a universal theme, and the puppy on the back just makes the card so cute! I am rating the difficulty level for this card as a "3" out of a possible "5" because of the transparent wheel spokes. If you make them solid, the difficulty would drop down to a "2". Donna, I think the effort you went to with the wheels was totally worth it. It's transformed the bike into something extra special. Love the subtle stripes too. Thanks for joining us again at Retro Rubber Challenge. WOW!! what a fabulous, creative idea to cut the wheels that way, you are one clever gal indeed!!! I'm going to keep that in mind to use it on my only bike stamp set I have. I so love the little puppy sitting there waiting for the ride to the park. I'm so happy you shared this card with us at RETRO RUBBER. This is fabulous! I love how you created the spokes...very clever and CUTE! Almost as cute as your little pup! Thanks for sharing this with us at Retro Rubber this week!